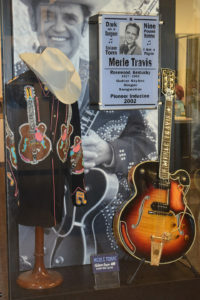 The Kentucky Music Hall of Fame and Museum joined Renfro Valley as a premiere tourist attraction, opening in 2002. The entrance to the building is unique to any other museum as it was once the original riding stables of John Lair. The museum is filled with a collection of artifacts and memorabilia highlighting the careers of over 50 inductees. A common misconception is that the Kentucky Music Hall of Fame focuses mainly on country and bluegrass related artists, however there are inductees from all genres of music including The Backstreet Boys, Loretta Lynn, Florence Henderson, Rosemary Clooney, Keith Whitley, Boots Randolph and so many more. You can also learn the history of music dating back to the 1700’s or pick up area information in the visitor center located in the museum lobby. The Kentucky Music Hall of Fame is open daily, year round. The Kentucky Music Hall of Fame honors Kentucky performers, songwriters, publishers, promoters, managers, broadcasters, comedians, and other professionals who have made significant contributions to the music industry in Kentucky and around the world. The Kentucky Music Hall of Fame has set forth a goal to be an educational source for anyone desiring to increase their knowledge of Kentucky’s music history and music fundamentals in general. The Kentucky Music Hall of Fame & Museum is located in Renfro Valley, Kentucky just off Exit 62 off I-75. Open daily from 10:00 am until 5:00 pm.